Tap your way to a record-setting number of floats with over 40 different characters ranging from from clumsy chicken to ferocious dinosaurs while dodging crazy and unexpected obstacles. 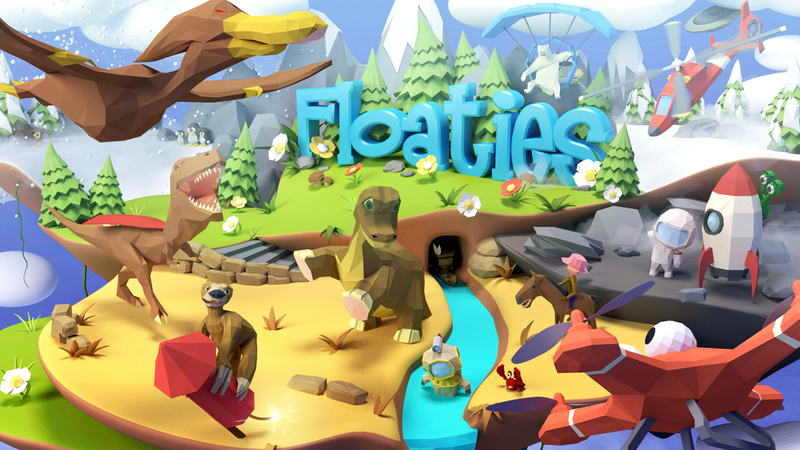 With an endless gameplay, Floaties will keep you hooked as you travel 8 different worlds filled with specific obstacles. All you have to do is tap to keep the characters floating, but the easy controls are balanced by an almost impossible gameplay. Dare to take this challenge? ✔ Endless Floating Gameplay. Control up to 4 “floaties” at the same time each with its own color by simply tapping to help them float. Each floatie is immune to the same color obstacles but is destroyed instantly by obstacles with other colors. Your main goal is to have a fleet of all colors and to try surviving the longest. Easy to play, but impossible to survive for long! ✔ 8 Adventurous Worlds. Help your floaties survive through the ancient world of Egypt, the sci-fi landscape of the Moon, the unlawful Wild Wild West, the dangerous Jurassic Park and more. Each of the 8 playable worlds feature its own particularities depicted in eye-catching 3D graphics so get ready to dodge out-of-orbit satellites on the Moon, T-Rex bones in Jurassic Park and hundreds others! ✔ Dozens of Characters. From flying drones, chicken, rockets to E.T., Cleopatra or even Jack the pirate you can unlock more than 40 different fun characters. Collect coins throughout the game and use those to spin the wheel of fortune to get a new random character or unlock your favorite one. Gain experience with each character and level them up to 5 stars! ✔ Powerups and abilities. Aside coins you can collect special objects that help you gain powerups for a limited time (i.e. collect 4 potion bottles to double your coin collection for 15 seconds). With your new abilities you’ll survive longer and score higher. ✔ Solve Quests. Each world has a theoretically endless flying/floating gameplay, although in reality you die A LOT, but offers side quests too. Can you collect 7 items of the same color? Or have one of RGBY floatie destroyed a couple of times? The more quests you solve, the tougher that level gets. You start at Easy, advance to Medium and become a master when you reach the Hard level of difficulty. ✔ Achievements & Leaderboard. Connect via Google Play Services to unlock more achievements and access the social or global leaderboards if your score is high enough. You’ll also be able to analyze the statistics for each world, such as how many items you’ve collected, how many quests you’ve completed, what was the best score and MUCH MORE! ✔ Multiplayer Challenges. Provoke up to 4 of your friends to a game of keeping floating characters alive! You can play the game in multiplayer mode and this gives 4 users the chance to play Floaties on the same device. Who can be the best? Only practice will tell! Aside surviving all sorts of entrapments that destroy Floaties of a different color (i.e. than the obstacle color) you must collect coins, power-ups and character resurrection items. Play often and you will be able to get free coins too by pulling the handle of a slot machine. The same game will unlock a random character for 100 coins. Each world you play in features awesome 3D graphics and well designed characters that create a great gaming experience especially accompanied by an entertaining soundtrack and sounds. THANK YOU for downloading, playing and rating Floaties! It means a lot to us. Have FUN!